The Bourdon Aircraft Company was incorporated in Rhode Island on February 6, 1928, by Allan P. Bourdon. The company initially began production in the former Gallaudet Aircraft factory in the Chepiwanoxet part of Warwick, but moved shortly afterwards to a former textile mill in the Hillsgrove portion of the city. Bourdon Aircraft was known for production of the two-passenger “Kittyhawk” bi-plane, said to “Fly like a hawk, and land like a kitten.” Powered by a 7-cylinder Siemans-Halske motor, it was 22 ft. 6 in. long, and had a 28 ft. wingspan. 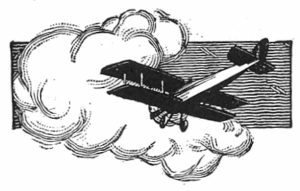 The aircraft was designed by Bourdon’s engineer, Franklin Kurt. The name “Kittyhawk” was bestowed on the aircraft because of the Wright Brothers flight at Kittyhawk, North Carolina, in 1903. The company finished it first airplane in May of 1928. On May 18, Allan Bourdon flew his Kittyhawk from Buttonwoods Airport in Warwick to Boston for its first long distance flight, which took a total of 32 minutes to complete. After being inspected by Assistant Secretary MacCracken of the U.S. Department of Commerce Aviation Division, the plane returned to Buttonwoods. By January of 1929, the Bourdon Aircraft Company had produced eight Kittyhawk airplanes. It was reported that the company intended to begin producing one airplane a week beginning in March of that year, some of which would be equipped with pontoons for water take-offs and landings. Unfortunately the production goal did not materialize, and a total of only thirteen Kittyhawks were built in Rhode Island. On April 3, 1929, it was announced that the U. S. Department of Commerce had granted the Bourdon Aircraft Company certificate number 134, signifying that their aircraft had met the standards of the D.O.C. regarding their ability to perform well in many kinds of flying conditions. On October 16, 1929, it was announced that the Bourdon Aircraft Company would be merging with the Viking Flying Boat Company of New Haven, Connecticut, and by the end of the month production would be moved to New Haven. The announcement came just thirteen days before the great stock market crash of 1929. In 1931, the Viking Flying Boat Company was acquired by Stearman-Varney Inc. which continued aircraft production in New Haven until 1936. The Providence Journal, “Bourdon Aircraft Company Merged; To Leave State”, October 17, 1929.